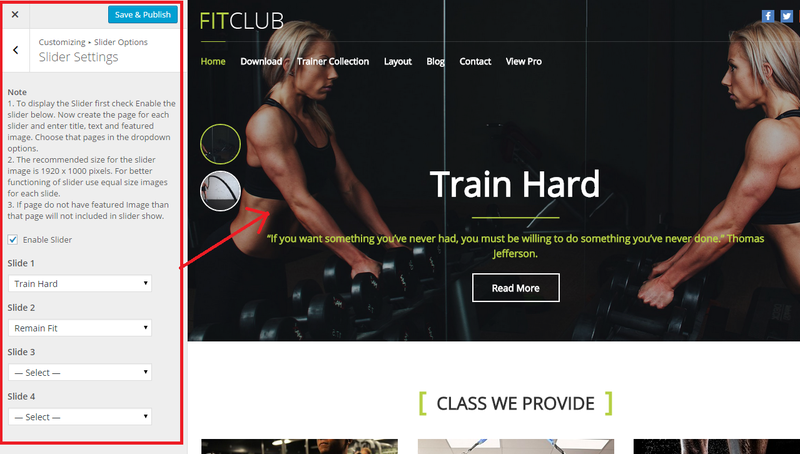 FitClub theme specially focuses on creating fitness, gym type of websites. However, due to its flexibility and easiness it can be used to create any types of sites. Installing your theme is pretty easy! After downloading you should have a fitclub-pro.zip file. This is a compressed file containing all of the required templates and images required for the theme to function properly. Primary MenuDisplay the menu below the logo/header text. Social menuDisplay the menu containing Social Icons right corner of Logo Location. Create 2 pages ie, Home and Blog Page. Assign Home to FitClub Startpage Template. FitClub provide seven awesome widgets that you can use in Front Page Template Sidebar to make your site look amazingly Beautiful. Go to Appearance-> widgets, drag/select the widgets in the Front Page Template Sidebar to display it on the Front Page Template Page. Display Call to action. 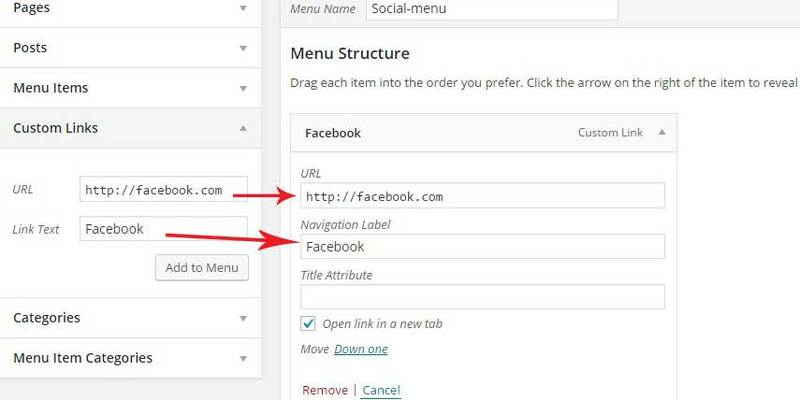 In this widget, select page for content, enter embed code of video, Button text, Button redirect link. There is also the option of background color and image. Set color to display it as backgound or Upload image. Note: You need to install “The Event Calendar” plugin to show events. Create events from WP Dashboard. Drag the TG: Event Slider Widget in the Front Page Sidebar and enter the Title and enter the number of events to display. Create pages for each Testimonials, enter the Title, Description, set a Featured Image and select the Testimonial Template. Drag the TG: Testimonial Widget in the Front Page Sidebar and enter the Title, Description and enter the number of page to display. Drag the TG: About Widget in the Front Page Sidebar and enter the Title, and select the page to display. Drag the TG: Opening Hours Widget in the Front Page Sidebar ( or Front Page Middle Left Sidebar if you want to make your site appear like demo) and enter the Title, day and opening hours for respective day. Drag the TG: Stats Counter Widget in the Front Page Sidebar ( or Front Page Middle Right Sidebar if you want to make your site appear like demo) and enter the Title, description, and fact detail, fact number and font-awesome icon for respective facts. Create pages for each FAQs, enter the Title, Descriptionand select the FAQ Template. Drag the TG: FAQ Widget in the Front Page Sidebar and enter the Title, Description and enter the number of page to display. 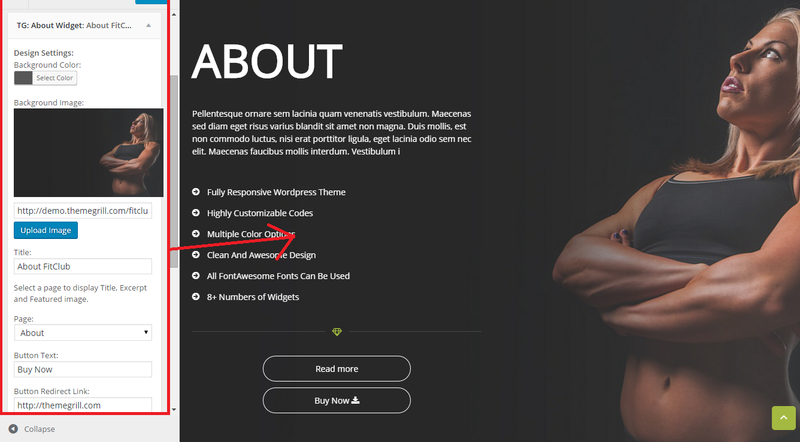 FitClub have Custom CSS Box which will ease your work if you need to add CSS in your site. Note: It will strip all the tags. Also, we strongly recommend not to edit the code in the theme’s file. All you changes will be lost if you update the theme. Use child theme instead. FitClub provides different hooks to add custom functionalities.